In recent years, the Illinois court system has seen a significant increase in wrongful death lawsuits involving serious bedsores. Often referred to as a pressure ulcer, pressure sore or decubitus ulcer, the skin lesion of a bedsore occurs as a result of prolonged pressure on the patient’s skin. Wheelchair-bound patients, and those confined to a bed, are often the victims of progressing bedsores in nursing homes, assisted living facilities, hospitals, group homes and other medical settings. Death from a bedsore often occurs when residents are not properly cared for in a medical environment. In many of the cases involving death, the patient suffered severe injuries and infection before their demise. Because of that, the surviving family members are likely entitled to take legal action including filing a wrongful death lawsuit against the facility responsible for causing the pressure ulcers. Usually, a successful lawsuit results in a monetary award at trial or settlement out of court. If you believe that your family member died as a result of his or her pressure sores, you may be entitled to pursue a lawsuit again the nursing home. Contact the attorneys at the Nursing Home Law Center today for a free case review. 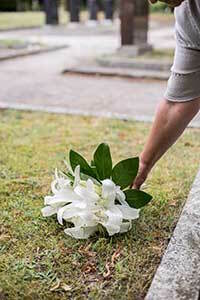 Why Bring a Lawsuit Following the Loss of a Loved One? Many surviving family members of a loved one dying of a bedsore want to expose the caregiver or facility responsible for patient neglect. This is because through proper care and quality nutrition, pressure ulcers are preventable. Unfortunately, many victims of nursing home neglect are the most vulnerable individuals that do not have the ability to complain to anyone concerning the improper healthcare they are being provided. Often times, the medical facility is at fault just as much as the negligent staff. This is because doctors, nurses, nursing aides and other health care providers are often overworked and understaffed. Some nursing homes and assisted living facilities will put profits ahead of patient care, and increase earnings by hiring an unskilled labor force. When the staff is too busy or not properly trained, vulnerable patients are often the first to be ignored. As a result, bedsores will begin to develop quickly. Suing the facility, medical staff and others involved when a bedsore has formed is a viable solution for a family seeking justice, to hold those accountable for elder patient neglect. With a skilled pressure sore attorney, family members of a deceased victim who died from decubitus ulcers can recover extensive medical bills and financial loss, and be provided compensation for their grief, pain and suffering. Typically, the primary cause in a developing pressure sore injury is lack of adequate care. Fortunately, the simple process of detecting an oncoming bedsore is easy. It requires detecting an area on the body, usually a bony prominence, where pressure, shearing force or friction causes a reddening or discoloration to the skin, which tends to be warmer or colder than the surrounding area. Alleviating the pressure by simply repositioning or turning the patient usually minimizes the damage. However, when left unattended, an oncoming pressure sore can quickly develop, causing significant death to skin tissue, especially on parts of the body with little or no body fat. This could include toes, ankles, heels, knees, buttocks, hipbones, tailbone, shoulder blades, shoulders and head. It is important for the caregiver to recognize the need for additional care for individuals that are unable to adjust their position. These could include paralyzed patients and those too old or ill to move on their own. Not every death from a bedsore is the result of negligence by understaffed, untrained or overworked nurses and aides. Some are the result of competent physicians and physician assistants who do not properly assess, evaluate and stage an ongoing bedsore. In these cases, medical malpractice can occur, where the misdiagnosis can quickly escalate a moderate bedsore into a life-threatening condition. No patient in a medical facility should ever die from a bedsore. When negligence is involved, the surviving family members of the deceased victim should consider hiring an attorney to hold those negligent accountable for their actions. A skilled law firm can seek out all responsible parties, file necessary paperwork and handle the entire lawsuit through trial, or handle negotiations in an out-of-court settlement. If a loved one has suffered serious bedsores and has died as a result, the surviving family members may file a wrongful death lawsuit for a bedsore to seek recovery. Nursing Home Law Center LLC provide an initial, free consultation and provide various options for seeking financial recompense in the Illinois court system. Our law firm delivers justice to victims of nursing home neglect and medical malpractice in Northeast Illinois. We take cases on contingency, meaning our fees are paid only when we obtain a positive financial outcome in your wrongful death lawsuit for a bedsore. Call (800) 926-7565 today to discuss the potential of your case with a skilled attorney.